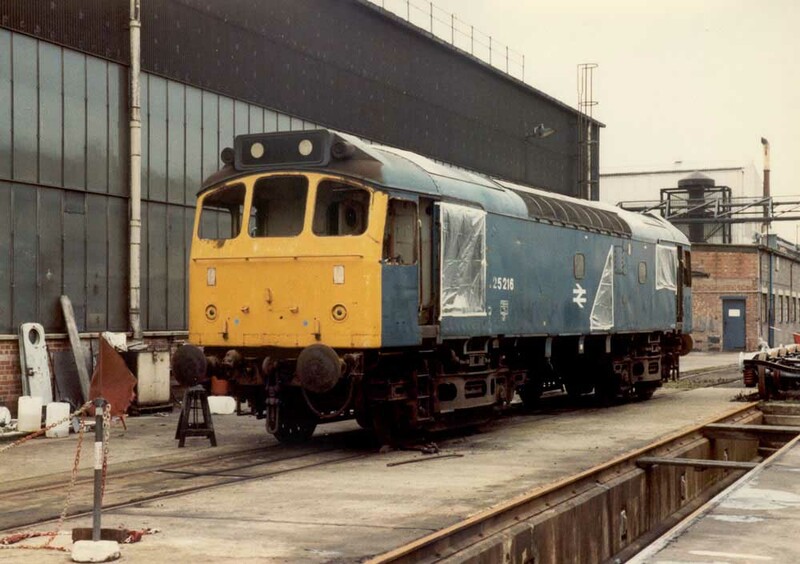 Photograph courtesy Malcolm Braim Withdrawn Class 25 No.25216 at Derby Works on December 5th 1981 undergoing component removal. The fourteen year eleven month career of D7566/25216 included allocations to Scottish, Western & London Midland Region depots. Time between withdrawal & scrapping: 26 months. May 1967 to Birmingham Division (D02). January 1972 to Nottingham Division (D16). 25216 was the 83rd Class 25 to be withdrawn, one of seventeen withdrawn during December 1980. After withdrawal 25216 was moved to Swindon Works on February 20th 1981, then to Derby Works on October 13th 1981. 25216 was scrapped at Derby Works during the first week of March 1983. 25216 at the Swindon Works Open Day on June 6th 1981. Photograph courtesy Jerry Glover 25216 on February 6th 1982 in the asbestos removal area. 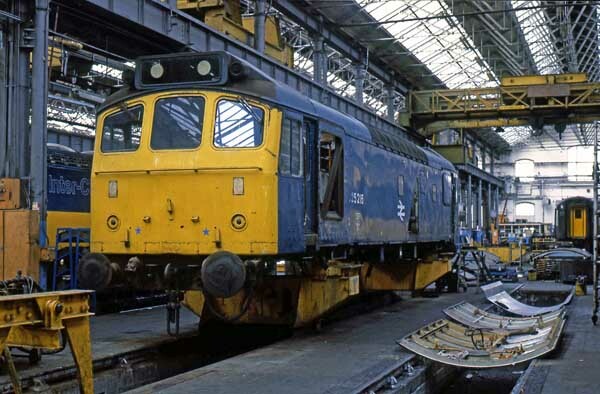 25216 would remain in the Works until March 1983 when it would be broken up. Noted Derby Works October 1966. Works visit assumed 1975/76 most likely Glasgow. On July 22nd 1972 7566 & 7554 worked the Derby - Norwich - Yarmouth - Norwich - Walsall diagram. Condition month uncertain: blue/yellow livery, no blanking plates fitted, hand/footholds plated over, straight sided sandboxes, three-rung bogie mounted footsteps, buffer beam steam pipe connections present. During October 1975 25216 was transferred to Laira from Cardiff. No doubt during the summers of 1976 & 1977 25216 would be used frequently on the Barnstaple - Exeter - Paignton - Plymouth locals. 25216 & 25052 were noted northbound at Par on July 23rd with loaded china clay wagons. On August 4th 25216 worked the morning Moorswater clay, then was noted shunting at Fowey. The next day (5th) 25216 worked a Liskeard - St Blazey freight. 25216 was noted at Penzance station on January 16th. 25216 was used to drag a fire damaged 1041 from St Blazey to Laira on February 15th, this was the last use of a Class 52 on the china clay trains. On September 10th 25216 & 25225 worked the 08.08 Wolverhampton - Penzance from Plymouth, returning to Plymouth with the 09.35 Penzance - Wolverhampton. The same diagram was worked on September 24th by 25216 & 25224. 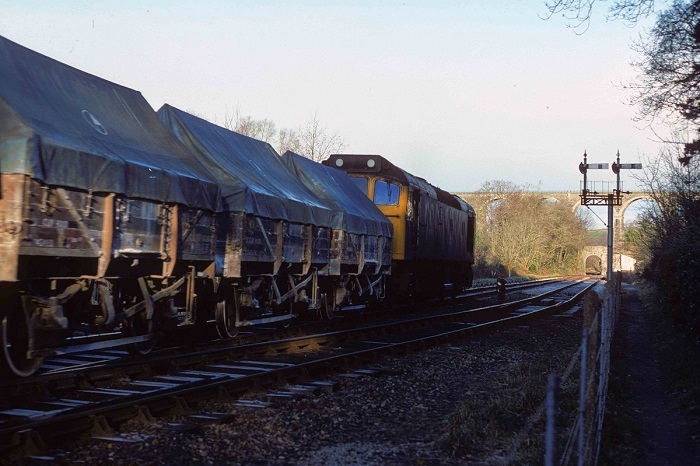 Photograph courtesy Roger Geach 25216 at Coombe Junction with empty clay hoods for Moorswater on January 13th 1978. 25216 was transferred from Laira to Crewe during March 1978. On September 7th 25215 was noted passing Stoke Works with three passenger coaches, the middle one apparently wrapped in plastic sheeting. The early morning Toton - Eastleigh freight was noted at Oxford with 25216 on July 25th. 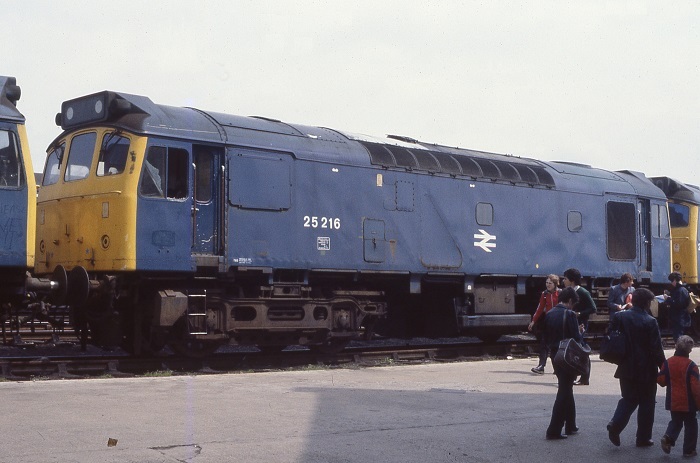 On August 3rd 1979 the 12.25 Crewe - Cardiff failed behind 25219 somewhere in the Hereford (?) area, 25216 dragged the service to Cardiff and returned north with the 17.10 Cardiff - Crewe. A Spalding - Aberystwyth day excursion on October 13th was worked from/to Walsall by 25216 & 25160. The last recorded passenger workings for 25216 took place during August 1980. On August 12th 25216 & 25217 worked the 13.00 Holyhead - Euston to Crewe, whilst on August 28th 25216 & 25168 worked the 20.30 Crewe - Bangor. 25216 was noted at Cardiff Canton on November 14th. 25216 was withdrawn on December 28th 1980. Page added September 7th 2013. Last updated December 11th 2018.